An electricity manhole is a little room buried in the street or sidewalk and is where utility workers access electric cables, switches, and other dangerous stuff. (In the old days, the majority of workers were men, so the term “manhole” stuck.) When a cable fails, workers splice together new and old sections—inside these manholes. Workers enter the manhole through a round entry, usually covered by—you guessed it—a heavy manhole cover. Inside, manholes are hot, dangerous, and creepy. If a cable fails, it generates a lot of heat and sometimes fire. Any debris caught in the manhole will worsen the fire. And if things explode, those heavy manhole covers go flying. The ArcGIS platform can help utilities better manage data and workflows, ensuring that inspections make sense and go off without a hitch. To keep operations running smoothly, manholes should be inspected and cleaned of all debris. But since there are so many tasks at hand—and, frankly, no one likes to inspect and clean manholes—this workflow often takes a backseat. I used to work at a power company that had 16,157 manholes in its service territory. Each one was numbered, from 1 to 16,157. After a number of manhole incidents, we decided to get aggressive with manhole inspections and cleaning. So where to begin? The logical choice was to inspect the manholes in numerical order, starting with manhole no. 1. And, of course, we cooked up some fancy paper forms to do the inspection. But after a year of working through the process, we were hung up at around manhole no. 200. Instead of having actionable information in hand, we ended up with a stack of greasy, hard-to-read handwritten forms that needed to be entered into a database. We decided to abandon the ambitious project and move to as-needed inspections and cleaning. It was clear we were never going to inspect all 16,157 manholes, given our limited resources. Plus, most of the manholes were just fine. The real problem was knowing how to prioritize targeted inspections. The trick to inspecting massive asset inventories such as manholes? You have to get smart. Smarter inspections mean figuring out which assets are most vulnerable to something going wrong. Which manholes are near debris sources? Which manholes are most likely to be flooded? Which manholes carry critical cables? Which manholes have been vacant for years? Which manholes are apt to have a higher incidence fires? The ArcGIS platform helps answer these questions by leveraging utilities’ existing geospatial data. The platform makes the data available across the organization, on devices that staff commonly use such as tablets and smartphones. And the best news—all this information sharing is done in a secure environment. If only I’d had this technology at my former company. With GIS, you have the power to determine which of the thousands of your utility’s manholes need to be inspected and cleaned. 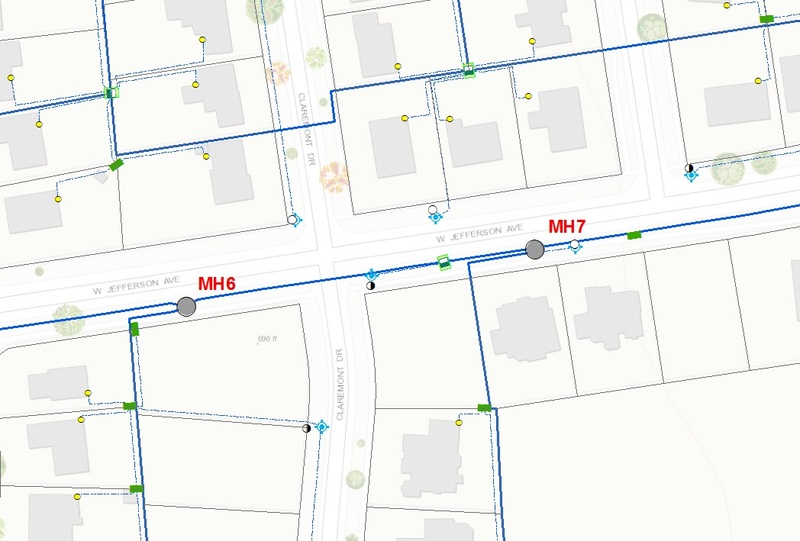 You can cluster these manholes spatially on a map in your utility’s GIS. As a result, you can schedule inspections for minimal crew travel time, or you can combine inspections with other fieldwork that is happening nearby. Plus, you can easily import all kinds of content on the ArcGIS platform, such as weather, crime, graffiti incidents, abandoned buildings, high insurance risk, and any other types of spatial data. You can mash all this data together and focus on the manholes that are most likely to create a problem. Smart inspections include three simple steps: organize, inspect, and report. Before you commence inspections at manhole no. 1, you need to organize. Organizing your data requires three key tasks: prioritizing, publishing, and sharing. To prioritize your inspections, start by identifying your assets based on geographic location and any special circumstances about these locations (such as areas that could be dangerous). Then publish your results for your organization so your operations department has a list of manholes to inspect. Finally, share your content with specific users within the organization. This gets the collaboration going. The next step, inspection, is where utilities traditionally focus the majority of their time and often waste the most effort. Inspections include two tasks: locating and updating. First, locate the asset and then conduct the inspection. Finally, record and update the findings on your mobile device and sync the data back to the office via a dashboard. The final step of the workflow is to report. Reports help utilities understand the status and priorities of work. To complete the reporting process, you need to monitor, analyze, and prioritize. Start by monitoring results coming from the field and analyzing these results to identify patterns and trends of facilities’ conditions. Using these insights, you can then prioritize the next day’s or week’s work by reviewing the status of activities and progress being made in the field. That’s what smart inspection is all about—taking a huge number of assets to inspect and figuring out the best place to deploy limited field resources. Don’t organize the old way, by number or some old inspection cycle. Employ smart inspection. This is what the ArcGIS platform does best. The platform gives you better access, awareness, and analytics—simply better execution of the tasks you have been doing for years. To learn more about how you can get started with ArcGIS for inspections and surveys, watch Esri’s Live Training Seminar series on Utility Asset Inspection Using ArcGIS.